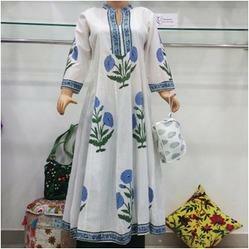 We are manufacturer of Kurtis. we preovied our clint a best quality in kurties. these are pure cotton block printed. we mfg in these product. We are manufacturer of printed kurtis. We make pure cotton Hand block printed. fully stiched.we are mfg. in these fabric. we makes Hand block printed long kurties in block printed cotton 60:60 fabric. we mainted a exports quality in these Kurties. Our Moto Clints satishfucations. Looking for Designer Kurties ?